There has always been a tension between mass democracy--the notion of popular sovereignty directly or indirectly exercised through the performative act of voting on discrete questions or for representatives in the apparatus of state--and governance. Western political culture adheres strongly to the principle of popular sovereignty, which may be asserted collectively on the body politic itself. Western political culture also embraces, at least in theory, the idea of popular engagement in the work of governance through a complex set of patterns of consultation and participation in the acts of governance that collectively define the state in its relations with the individual and collectively with the masses over which it asserts leadership authority. The recent decision to permit a plebiscite on the issue of the continued membership of the United Kingdom in the European Union, popularly known as Brexit, provides a useful example of the characteristics of the practice of mass democracy in states organized on the basis of representative governance. The full effect of that vote remains to be seen (useful discussion here). At a minimum it might well serve to reignite another mass democratic movement--that for the separation of Scotland from England/Wales (here). The practice of direct mass democracy is said to be asserted through the act of voting. Voting is most effective within systems that distinguish between mass democracy and governance by severely limiting the forms through which these official acts of mass democracy may be exercised. The principal function of voting, within these political cultural systems, is to the election of individuals--usually drawn from a group selected by those with influence in society--whose function it is then to govern, without substantial interference from mass democratic elements, except within those patterns of engagement that governance structures permit. These engagements can take the form of lobbying, of consultation and of participation in the debates about legislative programs, administrative actions and executive operations. And in many Western states, the most effective form of engagement is through judicial action--the judicialization of political life having been well explored by scholars over the last generation. When voting is extended beyond its bare essential--to elect representatives who govern; where voting is deployed to permit direct mass governance, the system of Western republican organization is strained. It is strained precisely because it overturns that fundamental separation between governance and mass democracy that is the foundation of the state in the West. Yet all Western states provide for exceptions to the framework of separation between mass democracy and governance. In the United States several states permit direct legislation by mass democratic action. And many states permit plebiscites on matters from the separation of a state into subsidiary parts (the former Czechoslovakia) to issues of the interpretation of fundamental rights (Ireland). Voting presents the essential act of democracy as exogenous to governance. That is that the act of voting, of selecting representatives falls outside the operation of the governmental system within which the delegated power of the sovereign people is exercised by their representatives. Once elected--and elected for their personal or factional characteristics among other reasons perhaps, the individual remains essentially free to act as her own personal agent, accountable generally only by having to stand for election periodically and by the somewhat broad constraints of law. (Democracy Part 31: In a World Premised on Exogenous Democracy is a Theory of Endogenous Democracy Possible?). Within this context such a close vote would suggest a failure of consensus and thus a call for no action until consensus is restored. That, in turn would suggest that UK elites would have to deeply engage their populations to reach a point of some consensus before any action is taken. But of course int he West, the fixation on the performance of voting and the creation of a fiction of finality, no matter how close the vote, colors response and consequence. No matter that this fiction is most useful only in the context of the election of a representative and that it is incomprehensible either where a legislature votes or where an issue of policy is a stake. Of course the practical realities around voting, in stable political societies in which there is little stress, reduces the effects of this fiction on efficient governance. Usually such voting is inexorably connected to the ability of influential elements of a state apparatus--its political, economic, cultural, societal and religious leadership--to help mold an appropriate framework for considering the issue put to a vote and then casting the vote appropriately, to suit the needs or desires of those governing elements of a society that in effect caused the exercise of mass democratic action to its own ends. That has been the typical connection between mass democratic action and governance that has worked well in the West ((here, here, here, here here, and here for example). possibility of developing a theory of endogenous democracy, one in which the touchstone of the democratic architecture of the state is centered within its government rather than in the periodic election of representatives to one or more of its organs. This is a preliminary consideration with specific application to China, where the possibility of a form of endogenous democracy is being considered. These ideas are further developed in the Chinese context in Backer, Larry Catá, Crafting a Theory of Socialist Democracy for China in the 21st Century: Considering Hu Angang's (胡鞍钢) Theory of Collective Presidency in the Context of the Emerging Chinese Constitutional State 16(1) Asian-Pacific Law and Policy Journal – (forthcoming 2015). In either context, I have suggested that voting--the performance of mass democracy has certain important uses that have made its invocation essential to modern conventional states--whether Marxist Leninist, Western democratic or theocratic (e.g., here). These include: 1. voting is a social act and an act of social discipline; 2. social discipline through voting manages violence; 3. voting serves as a measure of governmental legitimacy and affirmation of the authority of the mass democracy grundnorm as a basis of political organization; 4. Voting serves as a method of popular organization to support or undermine the state apparatus; and 5. The semiosis of voting: voting, serving as a physical affirmation of belonging, an acceptance of the basic premises of state organization, of obedience to its apparatus, and of the possibility of revolutionary change (discussed here). The discussion of the recent vote in the United Kingdom to end their membership in the European Union evokes all of these themes. And there is an element of usefulness in considering the details of the reasons for the result, and its consequences. Much of that discussion will be divided along the usual analytical lines. One can think through the result in terms of the arrogance of an elite that thought that it could send whatever question to a polity that would respond as instructed. One can think about this from the other side of that analytical perspective--the uncontrolled masses acting out in the face of the necessary structural adjustments that globalization demands--an open borders for migration, a transfer of power from a national to a transnational capital, a change in the character of regulation from a legal to an administrative basis, an assault on national cultural rules under pressure from a need to match a global culture to a global economic, political and societal system required for the efficient operation of global production chains--for economic, political and cultural production. One can view this result idiosyncratically as a necessary expression of the peculiarities of English history in the face of its union with Scotland and Ireland, it loss of Empire (twice, the first in the 18th and the second in the 20th century). One can instead consider the repercussion--for the unity of the U.K., to its economic relations with Europe and the rest of the world. But consider the way that globalization has made the result--or at least the sharp divide between traditionalists and globalists inevitable, bitter and unbridgeable. To that end it might be most useful to turn one's gaze from Europe in the 21st century, and the unique peculiarities of the European Union and the U.K. within it, to the 19th century in Japan in the aftermath of the Meiji revolution and its first several decades of modernization of a culture long insulated from global culture and economic flows. As a result of modernization, the Meiji state found itself in a peculiar position. It had effectively transformed the Empire into two quite distinct states existing simultaneous and separately within the same territory. One state comprised the Imperial household and the leading elements of society. These had embraced--reluctantly or not--the need for modernization, its forms and practices. By the end of the first decade of the 20th century, these elements of Japan were deeply embedded in global culture, economics, discourse and the like. They were, in the parlance of the times, ready to join the family of nations. But the Japan that joined the family of nations was only a part of the entirely of the Empire. Well within that same state continued to exist a large fraction of the population whose views and behaviors clung to traditional, nationalist, inward looking and customary forms of politics, economics and social organization. 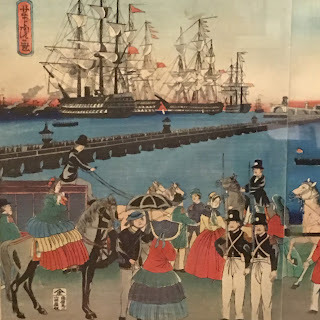 These elements of Japanese society were not connected to the global flows and cultures now open to the top ranks of Japanese society. To say that they were left out is incorrect--it might be better to see in this a willingness to continue to exist, self-reflexively and self contained, along times that were, for its communities, quite sustainable. Yet the result was the construction of two Japans which occupied the same territory and that sometimes came together. The existence of these two Japans significantly affected the way on which Japanese society faced the world. Globalization has produced the same sort of fracture of states within the territories of formally constituted nation-states. The world order developed through globalization stratifies populations in accordance with the position of individuals within or outside of global economic, cultural, political or societal flows. At the level of governance--the state is well populated by a community deeply invested in and embedded in global cultures--of law, politics, economics, societal organization, and practices--whatever the specific peculiarities of its national expression. These people are more closely connected with each other than with the rest of the communities of fellow citizens within the nation-state. In globalization, globally embedded communities are tied together through the regulatory governance, public and private, of global production chains, and of the necessary harmonization of views among elites that are charged with the integrity of these economic (and thus political and cultural) activities. And all around them, in states whose territories they share, these globally embedded communities exist alongside communities that globalization has not touched, or that has produced wounds and instability to an order and organization that is deeply self reflexive and otherwise untouched by the networks of regulations, and cultural affinities that mark the global elite. Developing states midway down supply chains for global production experience the existence of three distinct socio-legal states within states--that of the elites who participate in the global production community, workers and related businesses that participate in global production, and the rest of the population that re affected by globalization's effects but do not participate in it (discussed e.g., here). For this later group globalization brings change, instability and threat--with little corresponding benefit. This is the terrain of states like Bangladesh and South Africa. But it is also increasingly the reconstitution of the most developed states as participation in global flows determines both one's place within the national social and political order and one's engagement in supra national communities. It is possible, then, to recognize multiple substates making up places like South Africa or Bangladesh or, now, even the United Kingdoms within each nation-state. But this reality is increasingly contradicted by the political systems that continues to invest in the fiction of a unified polity within nation states embedded within global communities. States continue to operate as if they were a single polity when the effective reality is quite different. Globalization, like modernization a century earlier, then has produced a substantial disjunction--a rupture--between mass democracy and governance. This phenomenon has been particularly acute in Europe (see, e.g., Harmonization, Subsidiarity and Cultural Differences: An Essay on the Dynamics of Opposition Within Federative and International Legal Systems, 4 Tulsa Journal of Comparative & International Law 185-217 (1997); ). It has made the ties that bind tenuous and politically fragile (see, e.g., Forging Federal Systems Within a Matrix of Contained Conflict: The Example of the European Union, 12 Emory International Law Review 1331-1394 (1998); The Euro and the European Demos: A Reconstitution, 21 Year Book of European Law (England) 13-61 (2002)). It is quite clear that elites within Europe, and those connected to European, as well as global commercial and cultural flows, have much more in common with each other than they have with the person down the street whose social class, education or labor market position creates a border every bit as much a barrier as a stone wall. And, indeed, while most people were looking to the political divisions within the U.K. to explain the polling in Brexit, they forgot, if they even remembered to consider, the vast divide between globally engaged and globally local communities within Britain. It is possible, then, to see in the voting, not just the inability of U.K. elites to contain mass democracy under conditions of forced leadership when the population is restive, but as the expression of the quite different political cultures of a global Britain and a local Britain. This is a vote, then, that globalization as a political phenomenon, makes possible. And it is a vote that exposes, the crisis point of the traditional model of a symbiotic relationship between mass democracy and governance. The failure to take the ruptures of globalization within Britain serves as the foundation both for the folly of calling for a plebiscite and the inability to manage mass democratic sentiment in the direction sought for by governance elites. Folly follows from the rupture itself. The construction both of Europe and the globalized cultures in which it operates has been driven by a vanguard. That vanguard has produced Europe, but has also divided the masses within this global space between those within transnational communities and those outside. Those transnational cultures are supra national in outlook--those involved in supra national labor, culture, religious, cultural and societal communities and markets. These are the citizens of Europe. And these citizens include individuals plugged into global chains. But those communities outside of European space are increasingly national in orientation. They react against a threatening transnationalism and the normative framework of globalization that supports it, with an increasingly inward looking nationalism. These are the Japanese peasants and rural elements of the 1879s. But it is also the mass of national populations that have not been in or that have been displaced by the transnational project that built Europe. Consider the result where both communities occupy a single political space--like the U.K. A plebiscite invokes the mechanics of a single polity, but the reality is that this polity has been fractured. The voting community and the functional communities do not match up anymore. Te vote then becomes absurd. The performance of voting, then, does npt produce a representative result in the face of fundamental fracture. Folly is compounded when, having called for an election in these circumstances, those who traditionally manage mass democratic exercises fail to target their own masses. For transnational communities, those outside global space are as invisible--politically, socially and culturally--as were servants in Edwardian great houses. They have a role to play but are treated as invisible to those who run the house. And they are despised and tolerated. For the owners of these globalized Edwardian mansions, the serving classes have a duty to obey, to serve and to absorb the values of those who own the house. And that, indeed, appeared to be the tone of much of the debate--the management--of the voting sensibilities of the masses. The masters of the house--captains of industry, high prestige academics, elected representatives, and their counterparts globally (consider in this respect President Obama's intervention in this debate before the Brexit vote)--all deployed the language of the global to signal their instructions to the masses. These interventions were powerful--but only for those already members of the transnational community for whom this was meaningful. But for those outside European and transnational space--for those beneath the communities created and sustained by globalization--these elite appeals and arguments might be meaningless. The U.K. elites invoked the mechanics of mass democracy without considering its transformation in the wake of globalization. They campaigned to win the hearts and minds of their own transnational communities, and perversely by those exercise pushed those outside away and gave them a traditional mechanics to resist. This was not an exercise in mass democracy as much as it was an illumination of the character of the civil war now raging in many states. Globalization and its consequences, then, might provide an explanation of Brexit, in part. And then there is Scotland. Clearly, no single explanation can capture the complexities of the European Union, the U.K. within it, the politics within the U.K. and the insinuation of globalization within those discourses and actions. But to speak about the vote purely in national or regional terms is to miss an important element in the transformation of political discourse globally. The pressures and realities that fracture British society, especially in England are present in all states--even the United States and China are not immune. It affects developing states hardest, precisely because the fractures of globalization are more apparent in the breakup of the unity of the political structures of those states, But make no mistake, those fractures and its consequences will be felt in even the most developed states in the coming decade. The Brexit vote is a harbinger of more complex politics in the decade to come.